Stay tuned for part 2 of this course - the next 4 tips - will be released around April 14, 2016. If you enjoyed it, please let us know by emailing me at info@potentialsrealized.com. AND....By all means share this with your other solopreneur budddies, and wanna-be business owners! Lesson #9 - Have Fun and Do What You Love! Lesson #11 - Keep it Fresh! Is this mini=Masterclass really free? Yes it is! While we offer other paid on demand programs, as part of our 12th anniversary celebrations I wanted to make this available to our followers at no cost. Enjoy! I hope that you will learn more about what we have to offer and also join us in our paid programming. 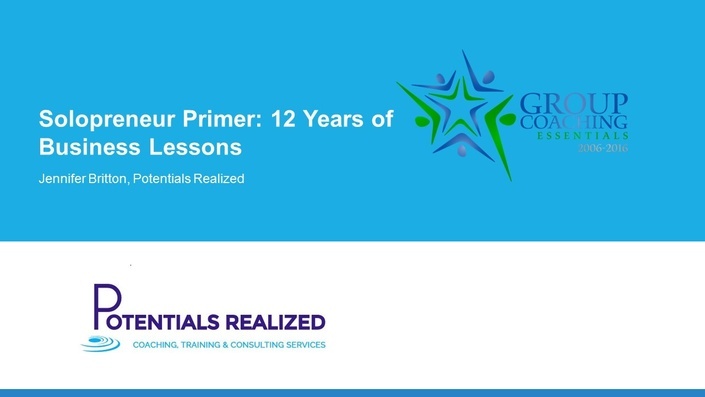 Join Jennifer Britton for this 3 part, 12 module video masterclass, as she takes a look back at 12 lessons she has learned as a solopreneur during her first 12 years of business.